Jinkies! When faced with complete absurdity, what is a parent to do, Velma? After all, your child talks intimately to Elmo and only vaguely approves of gravity. You don’t want to quash a normal fantasy life, but you want a responsible skeptic — not someone who argues for the sake of argument, but someone who is comfortable evaluating his world’s veracity. Sure, he’ll question your statements to bits as a teenager, but you also want him to question everything from the National Enquirer to the Pope and the Surgeon General. Sometimes the world throws parents a Scooby snack of support, as in Fred, Shaggy, and Encyclopedia Brown (the three wise guys). Scooby Doo is actually pretty cool. The show debuted in 1969 as a mixture of The Many Loves of Dobie Gillis and I Love A Mystery. The ensuing generations who looked forward to Saturday mornings as cartoon time also learned that the world is not always as presented by those in authority. And absurdity is revealed as absurdity when you strip away the glowing paint and flippers. Scooby has gone through numerous updates, but the essential message has gone unchanged. At least part of the secret of his longevity is that pursuit of the truth is its own reward. Copyright © 1969 Hanna-Barbera Productions, Inc.
Nine women are crammed into a VW Microbus, circa 1969. Polyhymnia is driving and she won’t let anyone touch the radio. Calliope is writing in her journal. She has a backpack full of journals. The backpack is army surplus. Clio is lecturing everyone on a variety of counter-culture issues. No one is actually paying attention. At the same time, Erato is reciting an ode to her current inspiration, a college boy with soulful eyes. Terpsichore has happy feet and is kicking the back of the seat in front of her. Euterpe is singing the latest song by the Mamas and the Papas. Melpomene is reading the newspaper, trying to quiet down whoever is being loudest at the moment, and swatting Terpsichore’s feet every time they kick her seat. Urania is plotting her star charts. Thalia is asleep with a smile on her face. Erato takes out her acoustic guitar and starts to sing “Me and Bobby McGee.” She does this a lot. A van can be seen in the distance, broken down by the side of the road. Polyhymnia slows down beside the other van. A surfer-type guy wearing a red ascot and no shirt is working on the engine. A redhead is sunbathing on the ground in front of the van. Clio asks if they need any help. “You know anything about engines?” He says, indicating that he does not expect them to be any help. Clio frowns, but Urania jumps out of the VW and shoves blonde guy away from his engine. Urania punches the surfer dude in the chest and says, “You’re all fixed.” She climbs back in with her sisters. 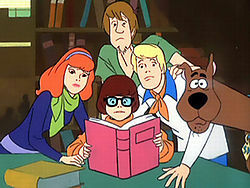 The passengers of the mystery Microbus stare dumbly at the van and its nine occupants. “Oh, for crying out loud!” Clio exclaims. “Come here, Blondie.” He drags his feet up to her. Clio wraps her arms around his head, leans down to his ear, and whispers, “Mysteries. Solve them. You’ll be good at it. All of you, together.” She releases him and the Muses drive away. You’ve Got to Check This Out is a blog series about music, words, and all sorts of artistic matters. It started with an explanation. 63 more to go.